Whether you’re looking to start creating your own recipes, or in search of insights that will let you take your existing recipes to the next level, Designing Great Beers is a must-add to every homebrewer’s library. 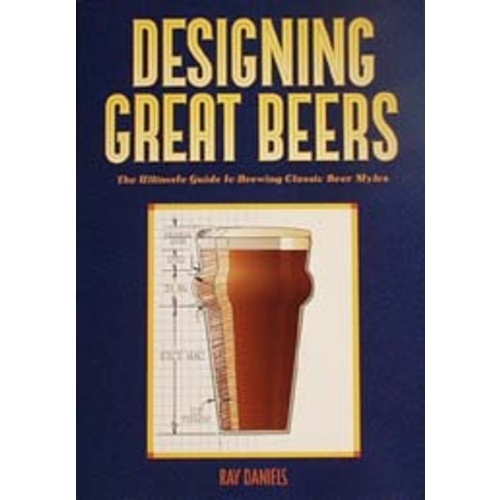 Authored by award-winning homebrewer Ray Daniels, Designing Great Beers is a comprehensive guide with in-depth information on malt, yeast, hops and how to choose the right ingredients for the beer you are trying to craft. The book is then organized into chapters by beer style, featuring information on their origin and history along with data from actual recipes that have won awards at the AHA national competition. If you’re tired of brewing other people’s recipes and looking to beging your own library, or in search of the added technical insight that will give you a leg up in your next competition, Designing Great Beers has your back. I wasn't especially into reading straight through this one, but It is immensely useful as a reference tool when creating my own recipes from scratch. I'd love for an updated version to this book. The recipe sections are pretty dated in terms of styles. But it's still a great resource for getting a better understanding on the nuts and bolts behind the brewing magic, while also helping with recipe design. There are a bunch of very useful calcs to fine tune your recipies. A terrific book, it covers a large number of topics. If you are an experiences all grain brewer you will come away with a greater appreciate ion of the ingredients and yeast, and be more able to make your own recipes, and know how to experiment with them. Characteristics of hops, grains, and yeast. No recipes. This book really helped me to feel confident and get creative with my recipes. I recommend it to anyone who likes or wants to create their own recipes. If your interested in developing your own recipes, this book is a must have. It has great general brewing info and tips, but has sections on almost every style. Each style focused chapter begins with detailed origins and histories of the style to guide those looking to do historical brews or just better understand the style. More importantly, the chapters contain info and data on award winning examples of the particular style with regards to malt bills, percentages of different grains, hop choices, hopping schedules, yeast and fermentation regimens. This book is perfect for brewers looking to develop their own recipe and need a little guidance an ddirection as oppose to just a recipe to copy. I use this book as a reference as a starting point for every recipe I develop and it's guidance has led me to numerous local and regional awards.